I drew this map to be used in an encounter in Storm King’s Thunder. It is used in the “Attack on Bryn Shander” section in chapter 2 (page 41). The setting describes a gate defense encounter versus a group of frost giants who are attacking the town. But there is no map provided in the book. 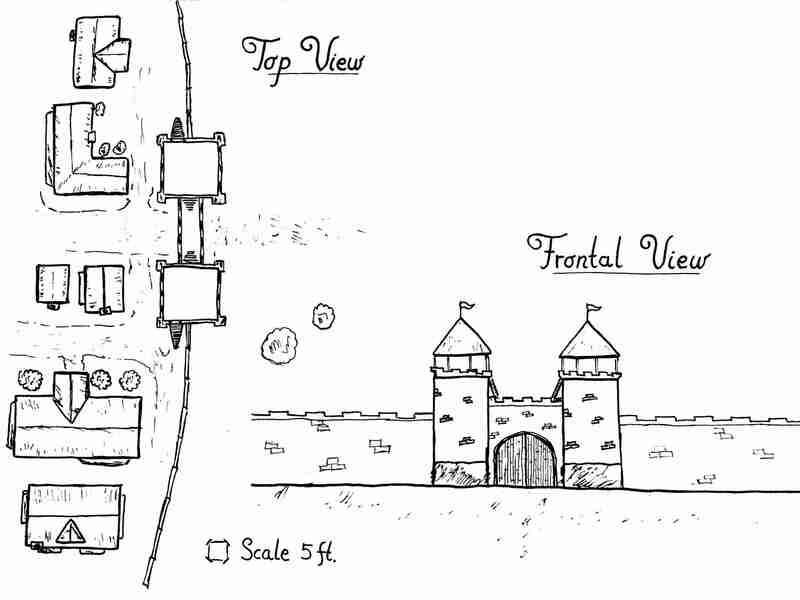 Although it was written for that encounter in particular, this map is useful for any town gate encounter. It’s great for tower-gate defense missions. The doors are 15ft high, they have AC 15, 200 HP and damage threshold of 10. While barred, the gates can only be forced open with a DC28 Strength check. The watch towers are 30ft high, both of them have stairs accesses to climb them, and to connect them to the middle section of the gate. Good map! Good post! What a epic battle! Thank you ! Yes it was awesome ! Awesome ! Yeah that’s right ! Cool map. Thx and congrats. Thank you for visiting the site. Hope you find it useful !